For over 20 years PACK & SEND has been supplying art shipping services to Galleries, collectors, dealers, artists and exhibitions around the world. Whether it be a single piece that needs to be moved from its place of purchase to its new home, or an entire collection to be moved to the other side of the world, PACK & SEND’s knowledge, experience and attention to detail will ensure your shipment goes smoothly. Our levels of customer service are legendary and we pride ourselves on having customers who become raving fans once they have experienced our service. PACK & SEND have an extensive range of international shipping methods from road freight, air freight to sea freight solutions for those extremely substantial art pieces or collections. Whether your shipment is destined for continental Europe or further afield we can provide a shipping solution that satisfies the demands placed upon it by yourself and your customers. Click on the image to the left to download our guide to Fine Art Shipping Services. All shipments require signatures upon delivery, are barcoded to allow for full traceability throughout the journey and where required we can provide un-packing and hanging services for the more discerning of your clients. For extremely sensitive pieces we can provide a full on-board courier service meaning that we will physically accompany your shipment throughout its journey to final delivery point. Through our imports team we can provide reverse collections and import back into the UK where pieces have been out for display or exhibition and require repatriation. We can also provide the facility to collect pieces bought or sourced abroad and import them back to the UK. At PACK & SEND we pride ourselves on our ability to deliver our brand promise of shipping anything, anywhere – no matter how fragile, awkward in shape, large or valuable. A large part of our ability to deliver this promise is our expertise in packing artwork; no matter how delicate or valuable the item may be and no matter what constraints are placed upon it by the shipping method. All our crates are made to the individual specification for the job in hand. They are made from the highest quality kiln dried timber all of which is 56/30 ISPM15 certified. Each crate can be lined with a variety of cushioning materials of various thicknesses and densities depending upon the nature of the item travelling. All can have wheels, hinges or handles if the job requires and polythene or waterproof lining if needed. Where a lighter and more economical outer packaging is appropriate we can build to individual specification tri-wall or double wall cases which saves weight whilst providing a robust outer casing. For those items that must travel upright or on any particular axis, an A-Frame can be added to the crate in order to ensure the correct orientation of the crate is maintained whilst in transit. For items that are of a particularly sensitive nature (either to vibration or through their fragility) crates and cases can be lined with our unique foam in place technology. The density of the foam can be electronically controlled to increase or decrease its density depending on the nature of the piece to be packed. Injected into the case or crate the artwork sits in effect in an aerated foam cushion whilst in transit providing protection for the most fragile of items. The best cushioning material is fresh air as vibration cannot pass through an air gap. Items of extreme fragility, therefore, will be packed in a void before then being cushioned within the outer case or crate using our foam in place technology ensuring safe transit of even the most fragile of items. PACK & SEND will advise and prepare all required customs paperwork to ensure your shipment or your customer’s shipment has a smooth transit through both UK customs and the receiving country’s customs authority. We can also arrange temporary export and import documentation and Carnets for works travelling internationally for exhibition. Where you or your client does not want to undergo the delay of having the shipment held whilst duties are paid we can arrange to ship duties paid meaning that there will be no hold up in customs whilst payment is awaited. 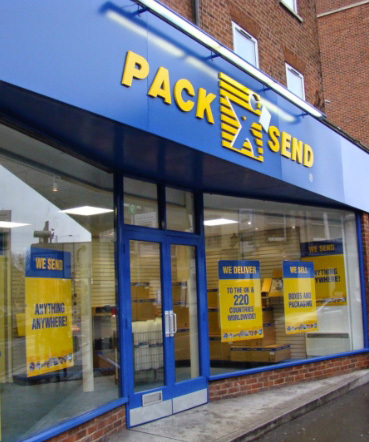 Whilst it is an unlikely occurrence, the PACK & SEND Warranty provides loss and damage protection to our customers whilst their items are in transit. Our Marine Transit Policy, specifically designed for PACK & SEND and underwritten by one of the world’s largest and most experienced freight and shipping insurers, enables us to provide unlimited cover for just about any type of item, whether travelling by air, sea or road…providing complete peace of mind. We are frequently asked to take on the task of shipping some extremely fragile items which have extended from Lladro collections to museum pieces such as the Meccano scale model of the Ferris wheel featured in the iconic film The Third Man. None of our artist customers, though, challenge us more than Luke Jerram and Valeria Nascimento. Valeria’s medium is porcelain and her installations often comprise of thousands of fragile petals mounted onto canvas or even the wall itself and finished in a design celebrating the natural world. On occasions we have shipped just the petals themselves and co-ordinated with Valeria who then travels to her client’s location to install the work personally. Luke is possibly best known for Museum of the Moon – his giant moon installation – which PACK & SEND helped ship around the world to exhibitions but it is his Glass Microbiology – a series of intricate glass sculptures and whose predominant theme is the beauty and complexity of viruses at a microscopic level – that present the real challenge. To describe Luke’s works as fragile would be an understatement. Our work for both artists and the Galleries that represent them means that we understand the sometimes unique pressures that can exist when shipping art. We also understand that your reputation with your customer is at stake and in commissioning PACK & SEND you are investing a huge amount of trust in us. That is why, whether we are shipping an entire collection for exhibition or a single piece to its buyer, we apply the same high level of preparation, planning and attention to detail in executing the shipment. We have over the years built strong customer relationships with many art dealers who continue to use our services time and time again. Whether they have sold directly or through one of the many online portals available to dealers, our world class service and sensible pricing means that we continue to be entrusted with a fundamental part of their business.